Have You Had Your Alpha Waves Today? But what’s the relationship between sunspots and stocks? Science might be about to uncover a cause-and-effect link between sunspots and human conflict — wars, uprisings, revolutions and so on. In short, more sunspots, more conflict. We should rewind a bit. On a sleepy summer day three years ago, we mused at length about the possible connection between sunspot activity and “mass excitability” — as theorized by the 20th-century Russian researcher Alexander Chizhevsky. Of course as we pointed out at the time, correlation doesn’t equal causation. Wet sidewalks don’t cause rain and all that. Nor did Chizhevsky posit a mechanism by which sunspots, and the geomagnetic storms they create, make people go more berserk than usual. He was just making an observation. But hold on: Researchers have just published a study that “offers convincing evidence that changes in Earth’s magnetic field can suppress alpha waves in the human brain,” according to a report from SpaceWeather.com. 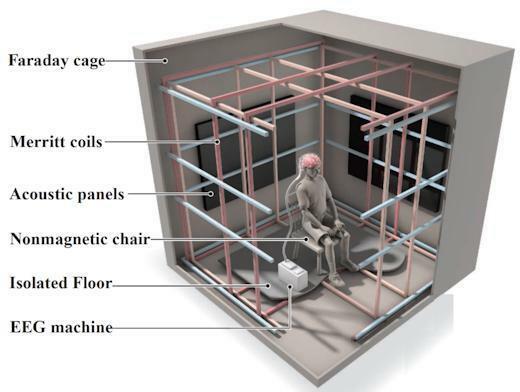 As a thought experiment, the article invites you to “Close your eyes and relax. Daydream about something pleasant. In this state your brain is filled with ‘alpha waves,’ a type of electrical brainwave associated with wakeful relaxation. So it’s really possible that people are more likely to be “spoiling for a fight” when the sun is crackling with solar flares. As you no doubt also notice, the most recent peak around 2012 was much weaker than the previous two. Indeed it was the weakest in a century. Outside of perhaps the Arab Spring and Occupy Wall Street, there was no major upheaval near the time of that peak, and thank goodness for that. Now we’re approaching the bottom of the current solar cycle. As we write this morning, there’s been a four-day stretch of no sunspots at all. Hmmm… Imagine how much worse the current social tensions in America might be right now if the sun were shooting solar flares in Earth’s direction day after day. If you’re wondering whether sunspots and “mass excitability” somehow translate to the economy and the markets, the answer is probably not. It was an American economist, Edward Dewey, who brought Chizhevsky’s work to Western audiences in the 1940s and ’50s. 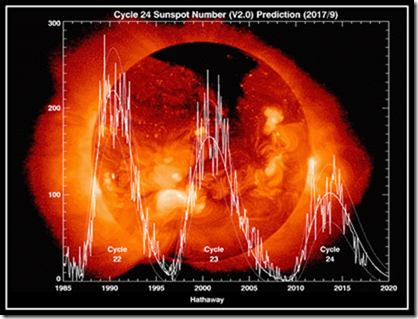 In more recent years a handful of finance bigwigs like Paul McCulley — who helped run the bond trading giant Pimco in its heyday — have also latched onto sunspot study, suggesting that peaks in the solar cycle coincide with peaks in the stock market. That might have proven true with dot-com mania peaking shortly before the sunspot max of 2001… but otherwise the linkage is more shaky. Likewise, certain stock market bottoms have coincided with solar minimums — i.e., 2009 and 1932 — but it doesn’t occur in a reliable 11-year pattern. The stock market appears set to end the week on an up note, a move the mainstream is attributing to a new round of U.S.-China trade talks. At last check the Dow and the S&P 500 are both up about a half percent, the Nasdaq about two-thirds of a percent. Bonds are selling off, pushing yields back up; the 10-year is at 2.43%. Gold remains stuck in neutral a few bucks below $1,300. The big market buzz surrounds the IPO of the ride-hailing firm Lyft — which the company priced yesterday at $72 a share. After the usual morning shakeout, LYFT opened just before lunchtime at $87.24. Euphoria much? The big economic numbers today come from the Commerce Department’s “income and spend” report. The wonks are still trying to catch up from the partial government shutdown in January, so not all the numbers are in yet. But the picture that’s emerging this morning is one of weak consumer spending and inflation that’s still short of the Federal Reserve’s 2% target. Thus, traders in fed funds futures are now pricing in a 64% probability the Fed will cut interest rates before year-end. On the “de-dollarization” watch, we see European leaders once again ignoring a diktat from Washington. For months the United States has been strong-arming other governments to ban the Chinese tech giant Huawei from building out 5G wireless networks in their respective countries. Washington is convinced Huawei’s gear is laced with spyware. On Tuesday, European Union leaders said, Thanks for the advice, but we’re going our own way. The European Commission directed its member governments to share data on 5G security risks and come up with countermeasures by year-end… but it pointedly decided against shutting out Huawei. The timing is interesting. 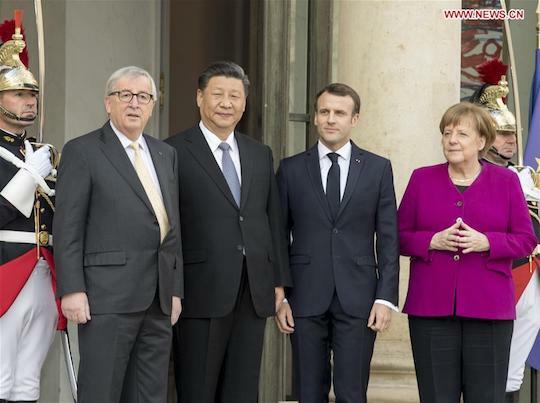 The decision came the same day Chinese President Xi Jinping was meeting in Paris with French President Emmanuel Macron. Springtime in Paris, autumn for the U.S.-European relationship? When it was over, the French and Chinese governments issued a seven-page joint statement that seemed directed in part at Donald Trump — affirming their support for the Paris climate change accord, the Iran nuclear deal and the World Trade Organization. They also signed a deal for China to buy 300 Airbus aircraft for a sum of $33.7 billion — nearly as much as France’s trade deficit with China. Those are planes the Chinese won’t be buying from Boeing. Increasingly it looks as if Washington is making European leaders choose between the United States on the one hand… and Russia and China on the other. Events like this week make clear the United States isn’t the default choice. The trajectory was in place even before Trump came along. Trump’s just giving it an extra push. History might look back on Trump leaving the Iran nuclear deal last May — an agreement whose signatories include Germany, France, Russia and China — as the watershed event. Russia and China are doing their utmost to pursue “de-dollarization.” If the Europeans get on board, it’ll be game over. Maybe not right away, but eventually. Meanwhile, Huawei just announced revenues topping $100 billion in 2018 despite D.C.’s anti-Huawei campaign. At least for the moment, the company thought it significant to note the milestone in U.S. dollars. But for how much longer? “I have to thank you for providing a resource for unbiased actual news. It is only here that I became aware of what’s gone on in Venezuela and Kashmir and many, many more places. If it weren’t for you, I would probably think that Mueller reports and Comey hearings were news and not just an MSM soap opera. “I haven’t noticed a decline in The 5 over the years,” affirms another. “I often learn a thing or two, I come back pretty much every day and I am often entertained — Emily’s goofy style, in particular, gives me a fair share of chuckles on the days she helms The 5. “Your content definitely isn’t what it used to be,” counters a third. “I do miss some of the flavor of the old 5 (or 6 or more, according to periodic complainers). Even as a busy business owner, I always found time to read it, particularly to fill me in on the actual important news since I can’t stand the drivel from the talking heads on TV and avoid that and newspapers like a jungle plague. “Not only was The 5 Min. Forecast succinct, but it was actual news — not someone’s agenda slanted just so. And it was very often stuff you wouldn’t hear anywhere else — unless it became so obvious that other sources eventually had to say something. I’m certain a number of Agora editors wore out their hazmat suits wading through the garbage every day to dig out the useful nuggets in those years. political content was isolated in new and separate publications. Perhaps there were too many complaints from more recent college graduates championing Modern Monetary Theory and myriad other related radioactive waste. “The move to other formats could have been OK, but various editor changes in those publications also got a little off the mark in fairly short order. And The 5 lost some of its soul. The 5: We appreciate the candor. But in chewing on your critique we’re still grasping at air trying to identify something we can do to keep you more in the fold. We still aim each day to unearth “the story no one else is telling,” as our founder and fearless leader Addison Wiggin exhorts us. It’s true there’s been turnover among our cast of characters over the years, even as the team has expanded. That’s the case with any publisher, really. Really, is there any doubt? That’s an increasingly lonely position in a world where it seems everyone is choosing up sides that both look unpalatable from here. Socialism versus nationalism? Globalism versus nativism? Include us out. P.S. One of our most popular presentations this year is also one of our most sensitive. So sensitive, we ask readers to put their initials on a nondisclosure form before they can view it. It’s not legally binding. It won’t store your information. We just ask that you not disclose what you learn to anyone else. Are you game? Access here. “The impact of this election cycle on markets will be profound. The stakes for investors have never been higher,” says Jim Rickards. Gold mining stocks aren’t necessarily pegged to the price of gold. Jim Rickards explains two idiosyncrasies. Are Apple’s Best Days Over?